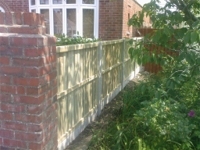 We offer a wide range of Building services, from fencing and patio laying to building restoration and improvements. 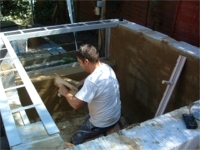 Below are a few of interesting jobs that we have carried out recently. 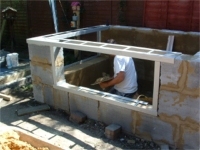 Call us on the number above or fill out our enquiry form for a free estimate. 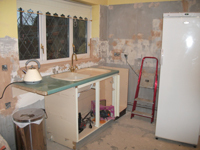 Recently we were asked to remove a pillar in a kitchen so it could be opened up to create more space ready for a brand new kitchen to be installed. 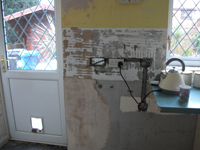 The pictures below show a before, during and after. 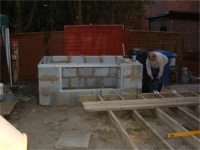 getting Council Building Control out to check the work. 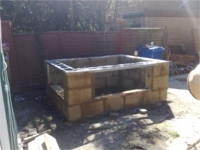 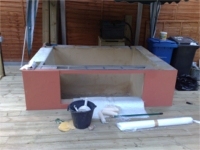 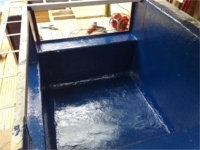 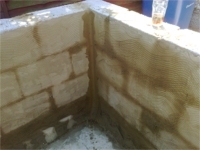 We were invited to render and fibreglass a small raised Koi pond as the following pictures show. 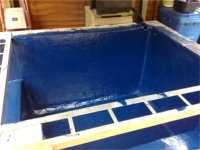 We have since rendered a number of Koi ponds from small to very large. 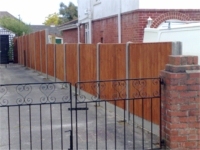 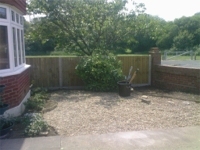 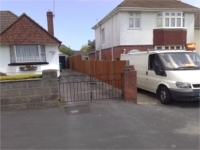 We installed an 80 foot fence using concrete posts, concrete gravel boards and close board wooden panels. 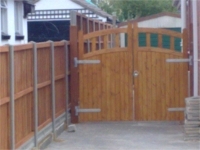 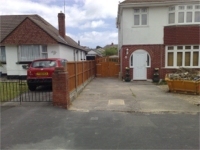 We also installed some wooden gates as shown in the pictures below. 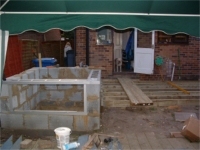 We built this 2-storey side extension, from start to finish. 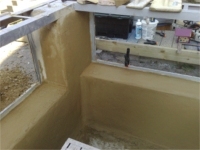 From drawing up the plans and obtaining planning permission, through to building the extension and finishing the inside with plastering and decorating. 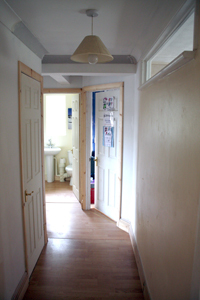 The extension formed a new downstairs study, and an additional bedroom and bathroom upstairs. 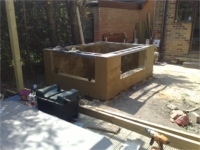 This included new steel supporting beams to open up a new corridor and landing, and reclaiming the bricks from a chimney stack to match the extension to the front of the house. 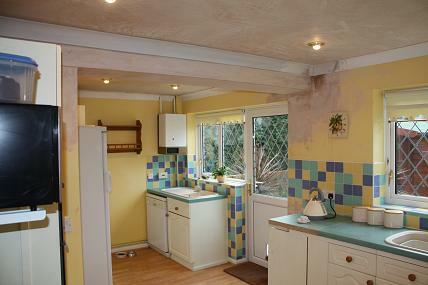 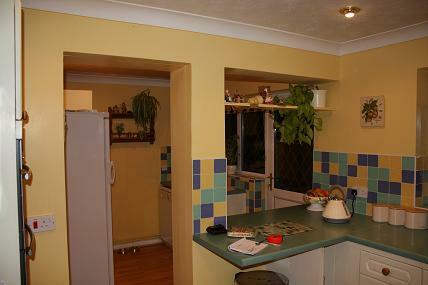 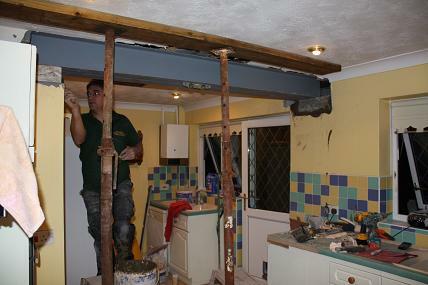 When we removed the beam from the kitchen as shown at the top of this page, we were also asked to fit the kitchen. 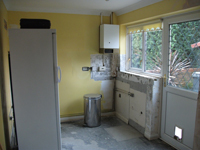 The client supplied the kitchen (from B&Q Cooke & Lewis range) and we carried out the fitting including electrics, plumbing and assembly. 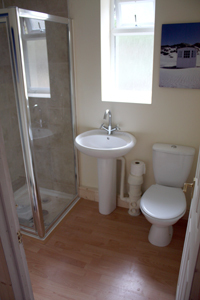 This involved adjusting the design to suit the space and completing the job by tiling the walls and fitting the laminate flooring.